The very concept of a false flag attack is to use weapons that one's framed enemy would have at their disposal. 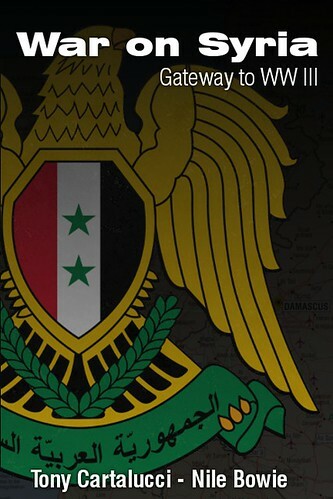 This report lays to rest the myth of exotic, inaccessible technology preventing US-backed terrorists from carrying out the Damascus attacks. Considering which party stood the most to gain from the attacks, and the amount of time that has passed with the West still unable to produce convincing evidence, it is clear America and its allies have failed (and will be unable) to make their case. 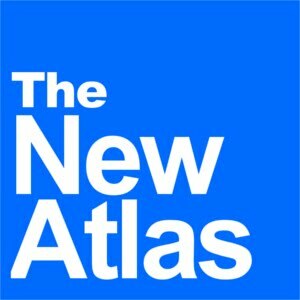 Video has now emerged showing just the sort of unmarked improvised trucks predicted US-backed terrorists would use to carry out the attacks, surrounded by a combination of civilian-dressed and semi-uniformed individuals firing ordnance identical to those used during the Damascus chemical weapons attack. Western media sources are scrambling to explain how this is instead, the "smoking gun" proving the Syrian government was behind the attacks, and not the so-called "rebels." The following video was just sent to me by @Paradoxy13, showing the type of munition linked to alleged chemical attacks being loaded and fired by what appears to be Assad's forces . Unfortunately for Higgins' credibility and objectiveness, the conclusion he jumps to (based apparently on the color hats everyone is wearing in the video) is based on "evidence" sent to him by Twitter user @Paradoxy13, an overt supporter of the armed militants operating in Syria. His Twitter timeline is proudly topped with the French-colonial flag now being used by the so-called "Free Syrian Army" and flooded with overtly biased propaganda backing both the terrorists in Syria, and their Western sponsors abroad. The alleged footage Higgins posted on his blog comes from YouTube account, "Darya Revolution" - clearly belonging to militant supporters. The moment of launching surface- to --surface missile from Mazzeh military airport -- it could carry a chemical head- on the day of the "chemical massacre" in Eastern Ghouta. Darayya Media Centre shot the missile at the exact second it was launched from Mazzeh Military Airport towards Eastern Ghout at around 6 AM. Many soldiers were seen around the point of launching the missile with red caps, which indicates that they were presidential guards. At face value, nothing about this points to the Syrian government - as Higgins claims. Higgins even has to remind readers that the chemical weapons attack allegedly took place at night, directly contradicting the description of the video he is citing as a "smoking gun." Image: After firing a single rocket, the truck is promptly covered and prepared for transit. The purpose of a national chemical arsenal is to provide a deterrence against foreign aggressors and for deployment in pitched, full-scale warfare. This modified truck was clearly designed for launching a single rocket, at a painfully slow rate of fire - not for tactical purposes. It is however, literally, the perfect vehicle for a false-flag attack, particularly the chemical attack carried out in Damascus in late August. 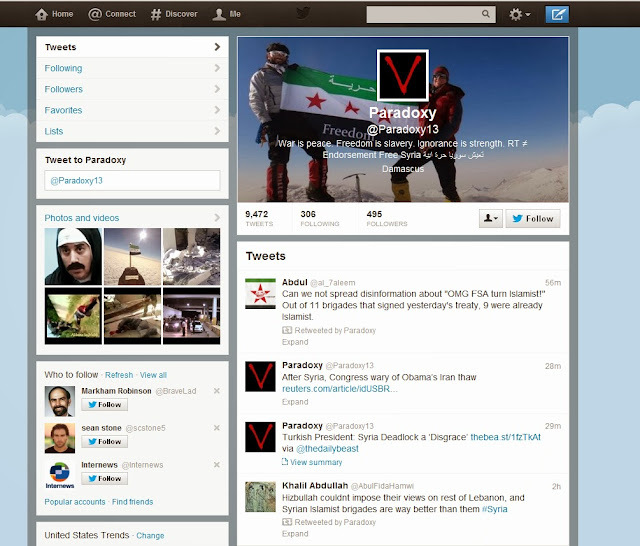 The video shows two trucks surrounded by a motley crew of both uniformed and non-uniformed individuals carrying a variety of weapons - typical of "Free Syrian Army" formations, atypical of the Syrian Arab Army's operations which include columns of tanks, clearly marked aircraft, camouflaged trucks, and soldiers in full battledress. 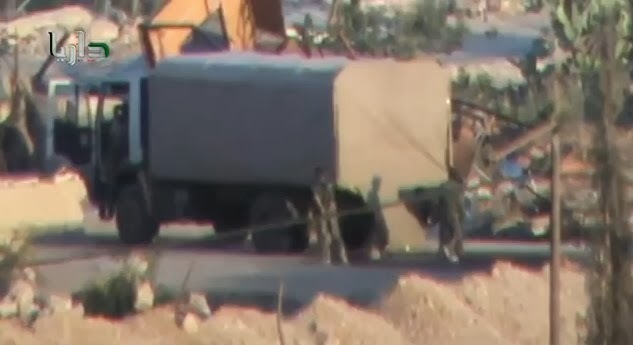 There appears to be one truck for carrying and loading the rockets, and another for launching them - the launcher can be seen at the end of the video being concealed under a tarp. 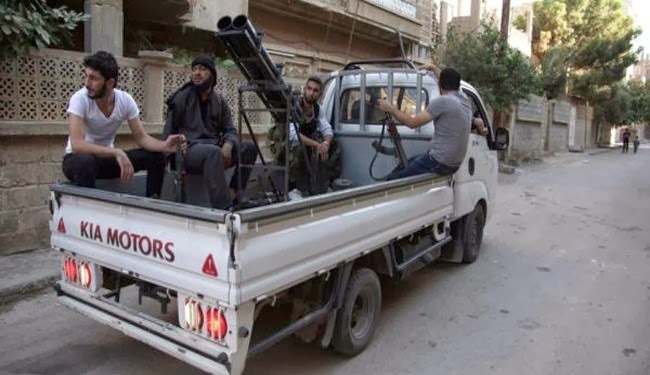 Aside from this, there are no other military vehicles seen in the vicinity, and the trucks themselves are unmarked, converted civilian vehicles typical of the "technicals" (improvised fighting vehicles) used by terrorists both in Libya and now Syria. For trucks allegedly carrying "government" chemical weapons, or even large high-explosive rockets, there is surprisingly lax security around them and a suspicious desire to conceal the improvised weapon system after use. Image: Terrorists in Syria, and previously in Libya, with the exception of stolen military vehicles, rely on improvised fighting vehicles of varying sophistication called "technicals" like the one pictured above. The larger flatbed featured in a recent video, launching a rocket similar to those found at the scene of an alleged August chemical weapons attack in Damascus, is also clearly an improvised fighting vehicle. The painstakingly slow process of loading and firing a single rocket would also negate any practical tactical advantage on the battlefield were this footage of another attack, on another day, using a conventional rocket for an artillery strike - as Higgins seems to suggest. The Syrian military possesses an extensive arsenal of artillery pieces and multiple rocket launchers that could easily bombard targets with better accuracy, increased frequency and effectiveness. Additional "evidence" cited by Higgins of "regime use" of these rocket systems consists solely of militant footage of rocket impacts - not of Syrian troops actually firing the weapons. Higgins operates under the false assumption that previous chemical attacks showing up in militant videos depicting similar rockets could only be the work of the Syrian government, and not false flag operations carried out by an increasingly desperate West and their proxy forces inside Syria. Aside from this assumption, he provides no evidence to back up his claims. Higgins was handed a "smoking gun" by the people most likely to have benefited from the crime, who claim they "found it" at the feet of the very government they are fighting. Without critical examination, and apparently based on the color hats several individuals were wearing, Higgins concludes that the footage portrays the Syrian government launching a single massive rocket from a modified flatbed. While the video above is claimed to be a "smoking gun," it instead, under critical examination, illustrates the means with which the false-flag operation was carried out in late August - for the sole purpose of justifying direct Western military intervention to save a faltering proxy war. That the same rocket used in Damascus has now been seen launched from makeshift flatbeds and not olive green military rocket launchers, along with answering the basic question of "to whose benefit?" and considering that militants are confirmed to have US training in handling of chemical weapons - all at the very least tear down the narrative that "only the Syrian regime" could have carried out the attacks.